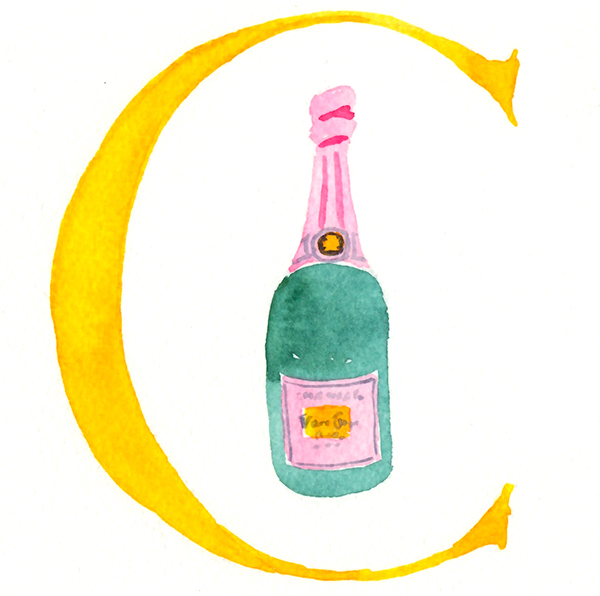 It’s hard to believe we’ve been throwing our Champagne Party for 19 years now. It’s morphed and changed a bit through the years, but one thing has remained the same – we’ve always hosted the Champagne Party in November. We feel like it’s such a fitting kick-off to the holidays – it gets everyone into a festive spirit and as it falls just before Thanksgiving, everyone has time to find a great sparkling wine they want to bring to their holiday gatherings. This year was a bit different for us though – we decided not to travel back to Seattle during the busy Thanksgiving season, so we threw the party for a whole new group in California. 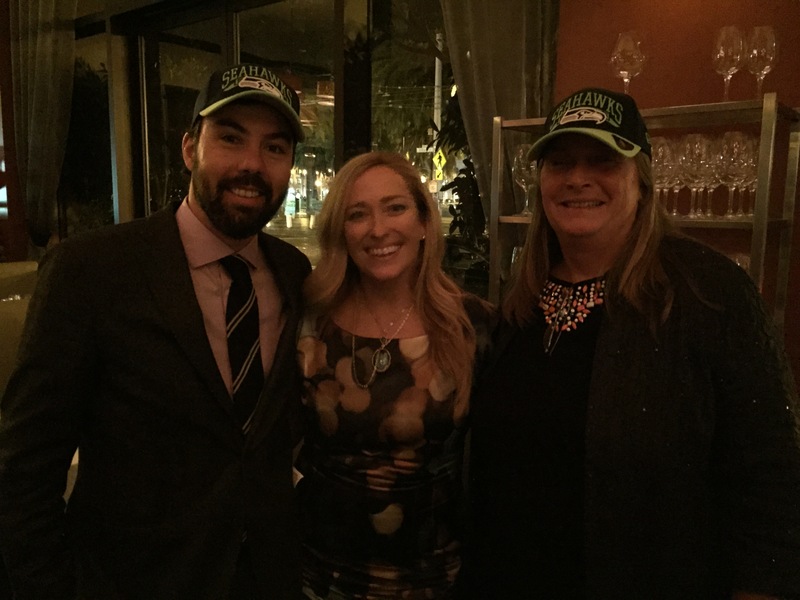 It was bittersweet, for sure – we missed our die-hard Seattle Champagne Party fans – but it was really interesting to introduce a new set of people to this tradition – and see how the more things change…the more they stay the same. 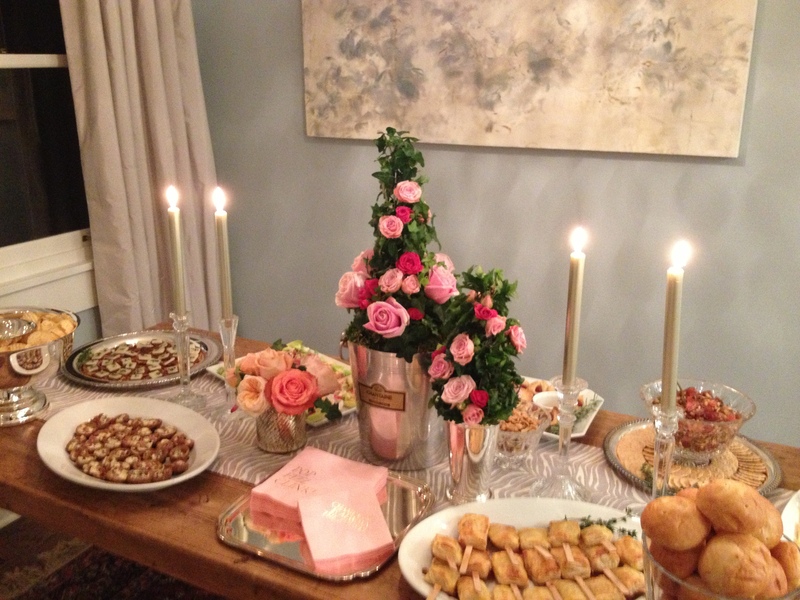 Got so busy with our guests, forgot to take a picture until the candles had nearly burnt out! This year the tasting consisted of 12 different Champagnes (technically 10 Champagnes and 2 domestic sparkling wines), ranging in price from $20 – $325. As always, the wines are served double-blind to everyone, not even my wife knows what we are going to taste ahead of time. By way of explanation, single-blind is when you know what all the wines are ahead of time, but not the order that they will be served in. Double-blind is when you don’t have any idea what the wines are ahead of time. To get a true opinion of what wines people like, I think it is important to serve them at least blind if not double-blind. I have found that when you have single-blind tastings, sometimes people spend more time on trying to figure out which wines are which versus trying to figure out which wines they like the most. Where the action took place – the day after. Before everyone voted on the wines, I told the story of our very first Champagne party 19 years ago, when 26 out of 27 people voted the 1990 Dom Perignon as the worst Champagne in the lineup. In that first year, we also had a bottle of the Charles Heidsieck Brut NV ($25 back then) and a bottle of the Argyle Brut 1992 ($15 back then). The Charles Heidsieck Brut NV tied for 2nd place that first year, along with the 1990 Roederer Cristal. It was really fun to try this party out with an enthusiastic new group – will be interesting to see how the 20th year comes together! It has been a busy year! We are so far behind in our blog, but have every intention of making up for lost time. To start, here’s the recap we have to add from last January’s (gasp!) Annual Bordeaux Fete. We need to get this down for the record before next year rolls around in a few short months! 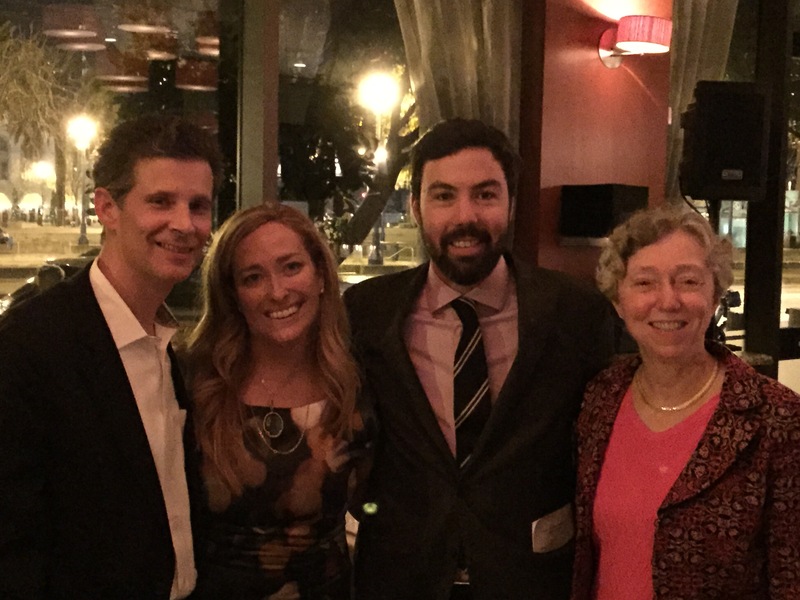 Bob Watt, Christina Watt, Jean-Charles Cazes from Lynch Bages and Nancy Rugas from Chateau Suduiraut. The 2012’s while not in the same league (or price) as the 2009’s or 2010’s, they are good in their own right. The 2012’s are medium bodied with good fruit/acid/structure and will be good to drink while you are waiting for your 2010’s to mature in your cellar. These wines will be a pleasure to drink in the near-mid term, particularly with food. This is always a fun event to taste the new wines and talk with the Chateaux proprietors that we have gotten to know over the years. This year in addition to Jean-Charles Cazes from Ch. Lynch Bages and Lilian Barton-Sartorius from Ch. 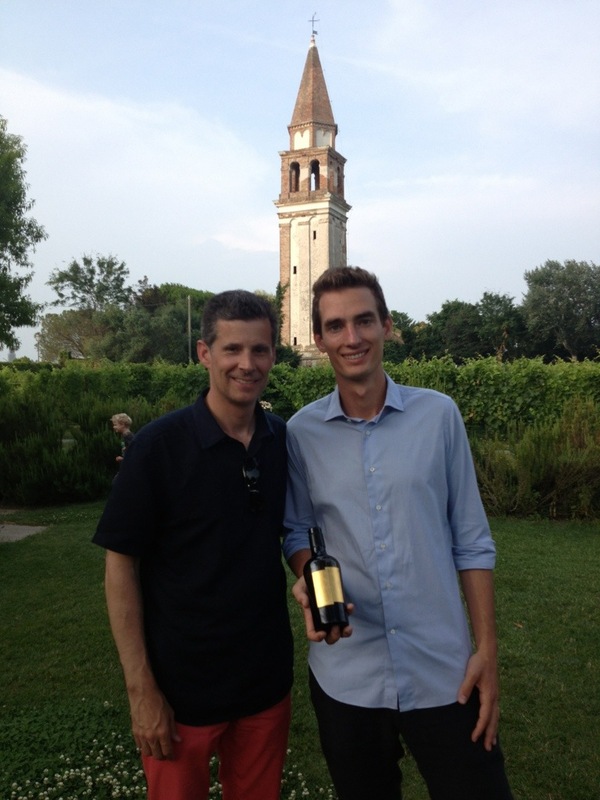 Leoville Barton, the event included Chateau Figeac, with proprietor Hortense Odoine Manoncourt. We had spent some time with Hortense at Chateau Figeac on our trip to Bordeaux and it was great to see her again. 2013 Blanc de Lynch Bages – Tangerine, lemon mineral nose. Very nice bright clean lemony white fruit, with a little stone mixed in. Lively acidity, smooth mouth feel, medium-light body. Nice long lemony energetic fruit finish. This is a very nice white Bordeaux wine that is only produced in smaller quantities, so it may not be easy to find, but is worth the effort. I will have to track some down for the cellar. 93 pts. 2009 Figeac – Ripe black/red berry fruit nose. This wine is lush with sweet black/red fruit, some spice and a little forest floor. There is good acidity to the wine, medium-full bodied with lots of very fine ripe tannins (iron fist in velvet glove). It is nice to taste a right bank right wine if a field of left banks, just for comparison. This is a very nice wine from a great vintage. 93 pts. 2005 Langoa Barton – Subtle nose of red / black fruit. In the mouth crunchy dark red and black berries, hints of forest floor and tobacco, with bright acidity. Nice medium – long dark fruit finish. 91 pts. 2005 Lynch Bages – This wine has a suave nose of spicy dark cherry fruit. In the mouth, the rich sweet dark black/red cherry fruit combines with baking spices and just a hint of leather. The wine has very nice acidity and very fine ripe tannins. The wine has great balance to it and a very long sweet spicy dark fruit finish. This wine is still very young, but is just starting to show what it has in store for a very long future. The 2005 Lynch Bages can be enjoyed now with air time, but will reward further cellaring. It wine will gain even more complexity as it is still on the uphill climb to maturity. Drink now or over the next three decades. 95+ pts. 2003 Figeac – Very ripe red and black fruit nose. In the mouth, very ripe dark red bing cherry and black berries, decent acidity, with a very tannic fine grained structure. Medium – long very ripe dark fruit finish. Over the course of the evening, the wine seemed to lose some of it’s acidity that supported the very ripe fruit. I would drink the 2003 sooner rather than later, over the next 10 years or so. 91 pts. 1995 Lynch Bages – Rich dark cherry fruit nose. In the mouth, plush sweet dark red / black fruit combine with forest floor and baking spices. This wine has good acidity, soft mostly resolved tannins and a long beautiful dark spicy fruit finish. The wine is drinking really well now and will continue to do so over the next 10-15 years. If you have some of the ’95 in the cellar, open one now and enjoy it. 94+ pts. 1999 Leoville Barton – Black cherry fruit and spice nose. In the mouth, very concentrated dark black cherries, spices and a little forest floor. Nice acidity, with some very fine grained ripe tannins still present. The wine has a very nice sense of balance, with a very long dark sweet black fruit finish. This wine is drinking really well right now, but I think it will continue to improve. 94+ pts. 2004 Suduiraut – Orangey-yellow in color, nose of very ripe fruit and butterscotch. In the mouth, again very ripe tropical fruit, over ripe melon, honey and butterscotch. This wine is too ripe for my taste, it doesn’t have the acid to back up the sweetness, so it comes across as heavy. Medium length very sweet finish. 82 pts. It just so happened that the same day as the dinner, the Seattle Seahawks made the finals for the SuperBowl. Since Seattle was the next stop on the tour for our winemaker friends, we zipped into the city early to buy them a little something so they could show their support at their next dinner. Jean-Charles Cazes of Ch. Lynch Bages, Christina Watt, and Lilian Barton-Sartorius from Ch. Leoville Barton. They were very good sports about showing their Seahawks support! It’s truly hard to believe this was our 18th year doing the Champagne Party! Unbelievable how time flies. 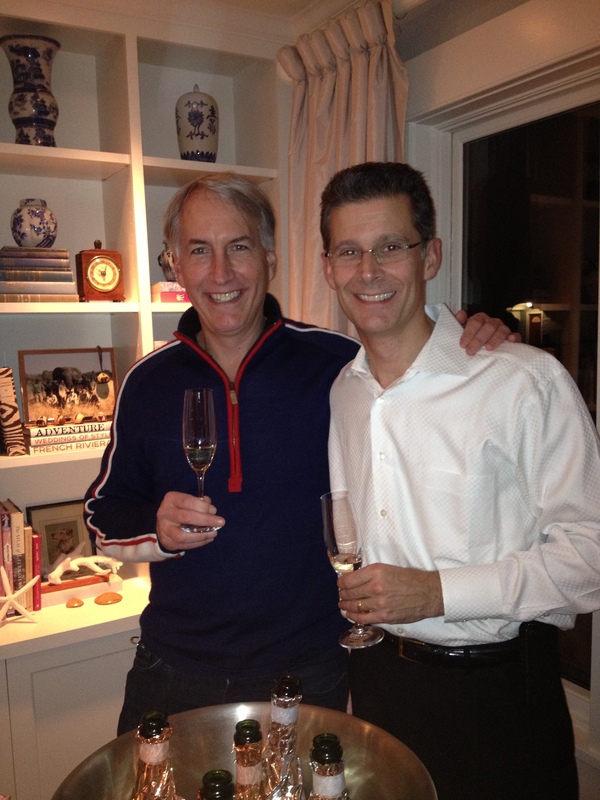 We are grateful to Jeanne and Will Hartmann, who offered up their beautiful home in Seattle to host the party this year. Jeanne and Will have been long time Champagne Party-goers, and when they heard that we were moving to San Francisco, they said, “We’re really sorry to see you go, but what are we going to do about the Champagne Party? ?” Fortunately for us, they offered to host in their house this year, so that the tradition could live on. The Champagne party is a double-blind tasting of generally 10 Champagnes, with a few sparkling wines from other regions of the world thrown in for comparison’s sake. The Champagnes will range from the low-end around $15 – $20, up to the high-end of $250 – $450 per bottle. After everyone has tasted through – and re-tasted to be sure of their choices – we take votes for the favorite and the least favorite wines of the night. I always enjoy seeing what people like. The beautiful table. I can never get enough of the food – I’m behind the bar all night! 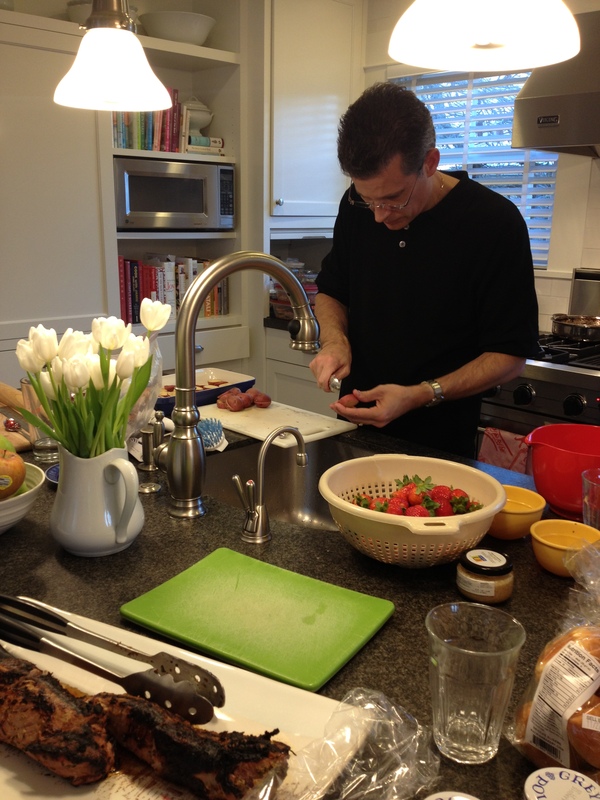 But I do slave away in the kitchen (well, a little bit anyway) – though admittedly, the girls did most of the work! I found it much more difficult than normal year to pick out the best and rank them in order, as did the group. Usually, there is a clear winner or two that stand out above the crowd, or something that is completely polarizing, but that was not the case this year. This year almost all of the wines showed well, but some (Launois, Ariston & Pol Roger) could definitely use some more bottle age to show what they have to offer. The champagnes, all ready to go. Professional taster? Brian Flynn and Bob Watt. We generally don’t repeat an exact same Champagne in multiple tastings, but we had the 2004 Roederer Cristal in the lineup last year and I included it this year as well, to test a theory. Last year, the group put the 2004 Roederer Cristal in 9th place and I ranked it dead last in 10th place. The Champagne was just totally out of balance, too sweet, not enough acidity with a very short unremarkable finish. It was exactly what you don’t want for a Champagne, especially for the price. I felt the Champagne just didn’t show well, but I really thought it should have fared better, so I decided to give it another go around. It’s amazing what an extra year did for the wine. The proof is in the votes, first place for the group and 3rd place for me. If you know me, you know I’m a Krug lover, and while I did single it out as my favorite, I was still very surprised at how the 2003 Krug showed this year. The group ranked the 2003 Krug tied for last place, so we had a run off and it barely beat the Launois. Neither the Krug Vintage or the Multi-Vintage has ever placed below 4th position in the 18 years that we have done this tasting, so to be ranked tied for last place is unusual for this wonderful Champagne house. I personally liked the 2003 Krug as a Champagne, but I have to say, I don’t think it will go down in history as a great Krug. 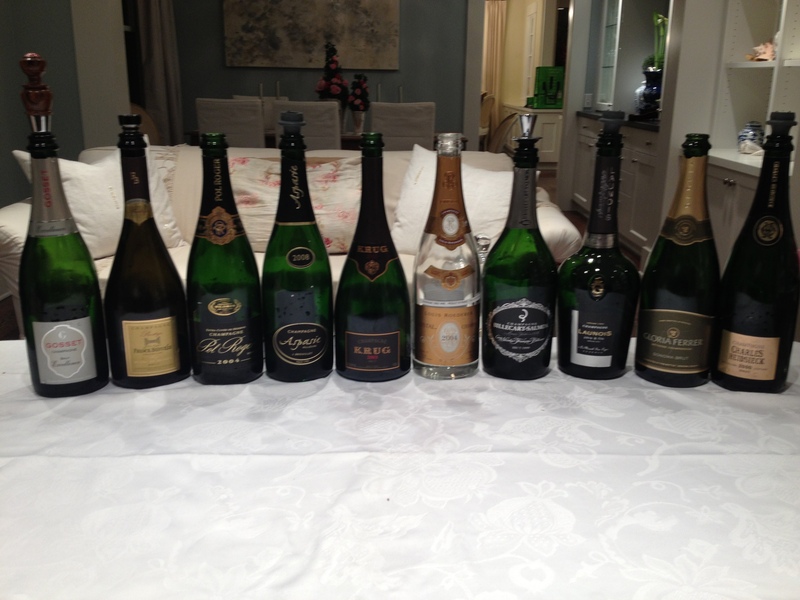 I think the 2003 Krug is the weakest vintage Krug going back through the 1985 vintage. Even the 1998 Krug is better and neither compare to the 2000 Krug, which is, or will be, a great Krug. You may ask why I ranked this Champagne in 1st place? Bottle bias? Perhaps, but in my opinion, the 2003 Krug has all of the telltale signs of what Krug is, which I absolutely love, but is just much more restrained and subdued. Only myself and two other die-hard Krug fans picked the 2003 Krug for 1st place. Even my wife, Christina, went a different direction, picking the 2000 Charles Heidsieck as her favorite, and she usually can pick out a Krug Champagne in the lineup if there is one. I will be very curious to see how the MV Krug Champagne that is based on the 2003 vintage tastes in comparison to the 2003 Krug. Being a blend of multiple vintages could be a plus in this case and give the Champagne more of the Krug character that I love. You’re all winners in my book. The Champagne party is always a great way to kick off the Holiday season. As many know, Champagne is a passion for me, but too many people think of Champagne as just for celebrations and special events. It is first and foremost wine (with bubbles), that pairs great with food and is an absolute must in any cellar. Life is too short not to drink Champagne on a regular basis! 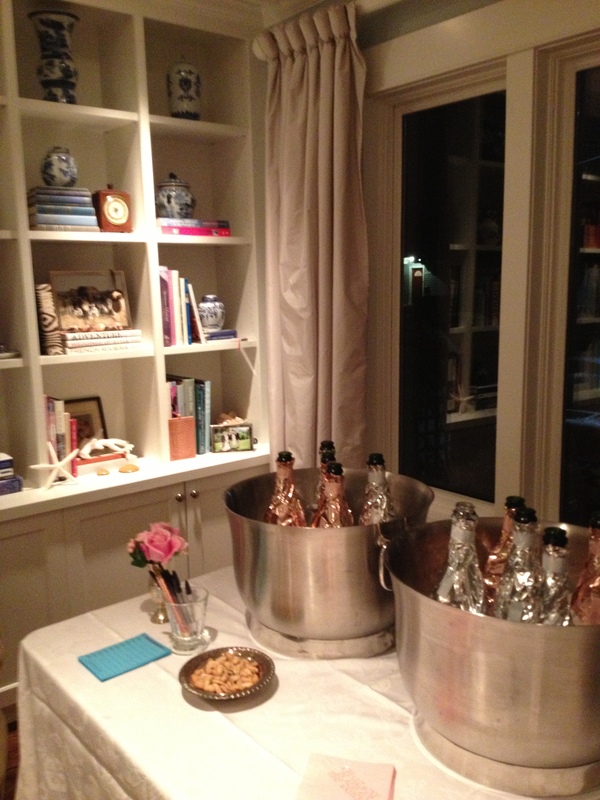 Now, what to have for our 19th Annual Champagne Party…stay tuned! It’s been a long time – about four months since we’ve last officially posted. In that time we spent a month in Europe and moved to California and basically re-invented our lives as we knew them. It’s been an exhausting and exhilarating few months – we admit to being glad that things are slowing a bit from frantic to a dull roar. We have so many great wine moments to share over this time – it’ll be a while before we get through the highlights, but thought we start out a little more simply. When the kids were born over 10 years ago, my wife gave me a case of Bordeaux wine, three bottles each of 1996 Pichon Baron, 1996 Leoville Barton, 2001 Brane Cantenac and 2001 d’Issan. The idea was to open a bottle every year for the kids birthday. This year we had a bottle of the 2001 Brane Cantenac from the Margaux rejoin of Bordaux. While we are still exploring and discovering things in the area where we have moved to, we found a nice little “French style” restaurant called Left Bank. How fitting that we just happen to have brought a left bank bottle of Bordeaux with us for dinner, the 2001 Brane Cantenac. Most of the 2001 Bordeaux wines that I have had have been open for business and this was no different. For those of you looking for a nice Bordeaux wine to drink now, check out the 2001 vintage. Many of the wines are drinking really well right now and can be had for a song compared to the 2000, 2003 or 2005 counterparts. The 2001 vintage was really overlooked after the great 2000 vintage, but there are some really wonderful wines to be had – Lynch Bages, Montrose and Leoville Barton just to name a few. Birthday dinner at the Village Pub. 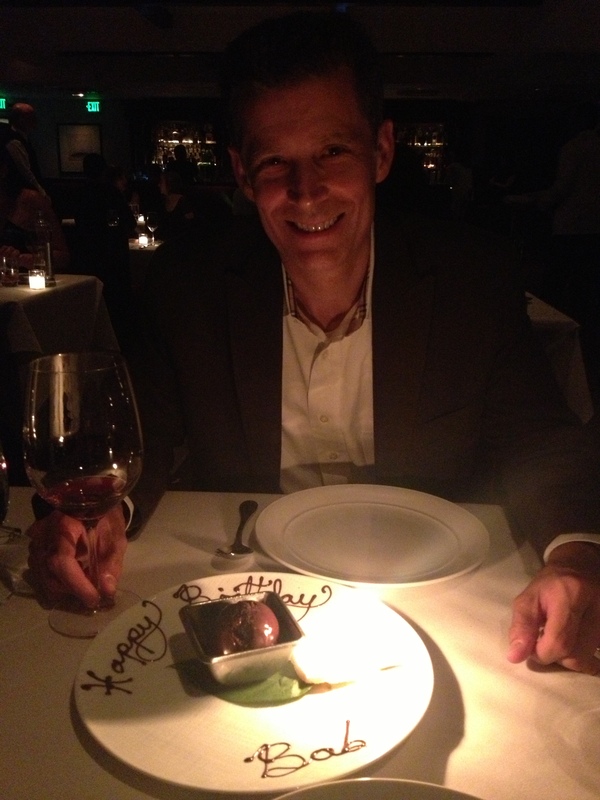 In other great wine moments, for my birthday this year in September, Christina and I wound up at the Village Pub in Woodside California, just north of where we live. 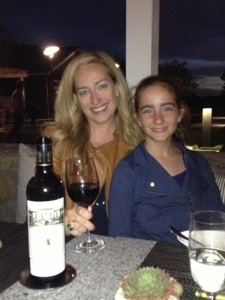 Don’t let the name fool you, they have a REALLY nice wine list and the food is excellent. The Sommelier at the Village Pub is a very nice and knowledgeable guy by the name of Michael Acheson. The Village Pub’s wine program was awarded the Wine Spectator’s Grand Award under Michael’s direction. 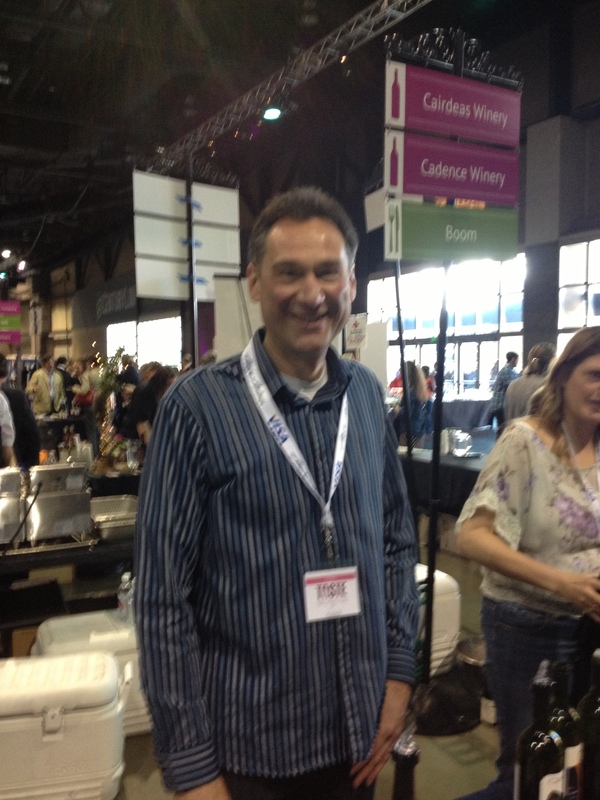 Michael has a great passion for wine and loves to help patrons explore the world of wine at the restaurant. We had an excellent meal, unfortunately, the wine I brought for the occasion (2003 Domaine Pegau Cuvee Reserve) was corked. Maybe I have been lucky, but I bring wine to restaurants all of the time and I honestly don’t remember the last time one of the bottles was corked, maybe 5-6 years ago. Anyway, Michael was able to guide me through the wine list and offer nice suggestions once we had picked out main courses. We ultimately had some very nice red Burgundy and Cornas wines with our meal. 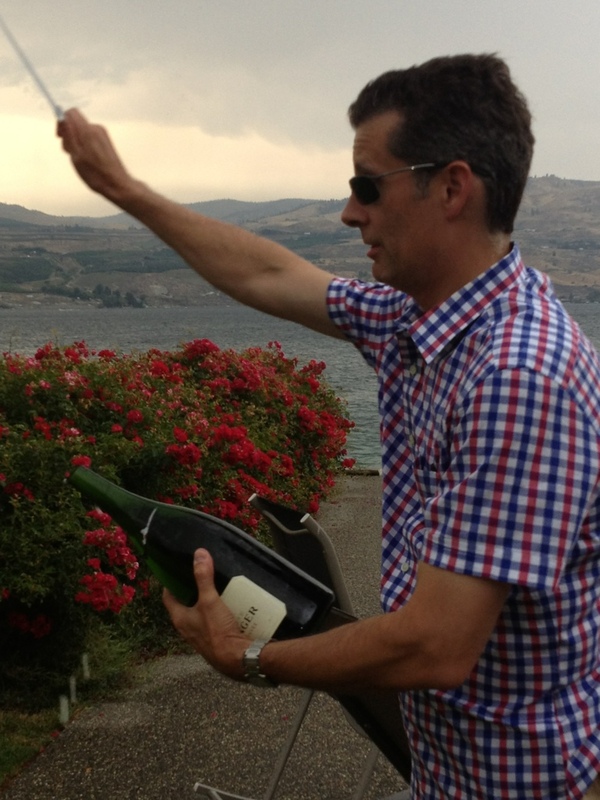 A magnum of Bollinger makes a cloudy day at the lake much better – especially when it’s sabered open!